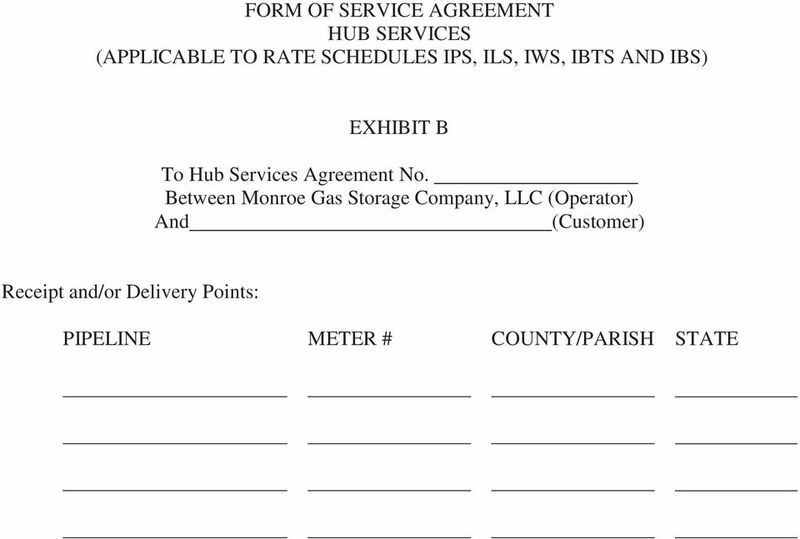 Download "FORM OF SERVICE AGREEMENT HUB SERVICES (APPLICABLE TO RATE SCHEDULES IPS, ILS, IWS, IBTS AND IBS)"
2 Commission, and this Agreement. 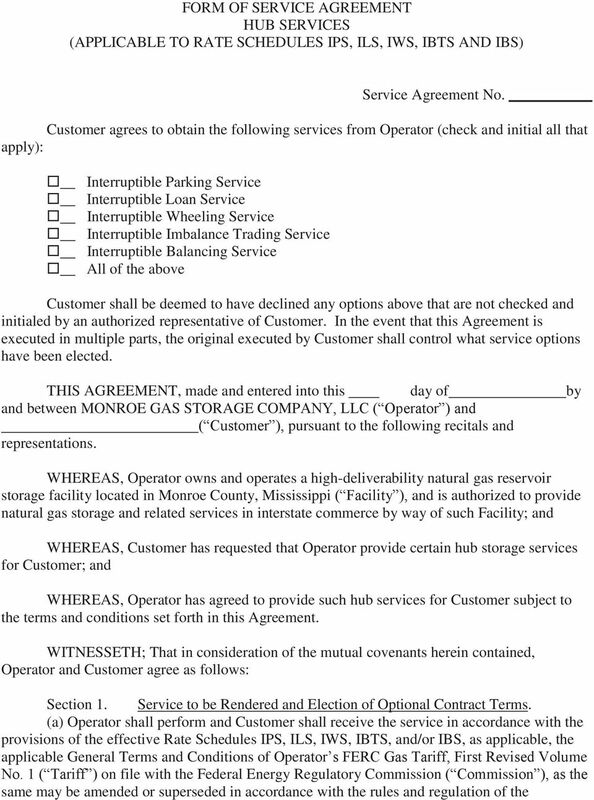 Operator shall, on any Day, provide interruptible service for Customer and shall receive, inject, park, loan, store, wheel, withdraw and redeliver the quantities of natural gas up to Customer s MDIQ, MDRQ, MDWQ, MPQ, MLQ, MDDQ, and/or MDTQ, as applicable and as set forth in Exhibit A hereto. Operator s obligation to accept gas from Customer, and Customer s right to cause Operator to redeliver a thermally equivalent quantity of gas to Customer, less applicable Fuel Reimbursement, is limited to Customer s MDIQ, MDRQ, MDWQ, MPQ, MLQ, MDDQ, and/or MDTQ, as applicable, specified on Exhibit A attached hereto at the Point(s) of Receipt and Delivery specified on Exhibit B attached hereto. Service hereunder shall be provided subject to the provisions of Part 284 of the Commission s Regulations. Customer agrees that Operator shall have the unilateral right to file with the appropriate regulatory authority and make changes effective in (i) the terms and conditions of this Service Agreement, pursuant to which service hereunder is rendered, (ii) any provision of Rate Schedules IPS, ILS, IWS, IBTS and IBS or (iii) any provision of the General Terms and Conditions applicable to this Service Agreement. Operator agrees that the Customer may protest or contest the aforementioned filings, and the Customer does not waive any rights it may have with respect to such filings. (b) Customer has the option, at its sole discretion, to elect whether to include as part of this Agreement: (i) the limitation of liability provision pursuant to Section 7 below; and (ii) the waiver of jury trial provision pursuant to Section 10 below. If Customer wishes to include either of such provisions Customer must indicate such election by checking the appropriate box in Sections 7 or 10 and placing a duly authorized representative s initials beside same. Failure to make an election pursuant to Section 7 or Section 10 shall result in such provision(s) being excluded within the terms of this Agreement. Customer s election of either provision pursuant to Section 7 or Section 10 is not a condition for obtaining service under this Agreement and Operator s Tariff and shall not affect any other provision of this Agreement. 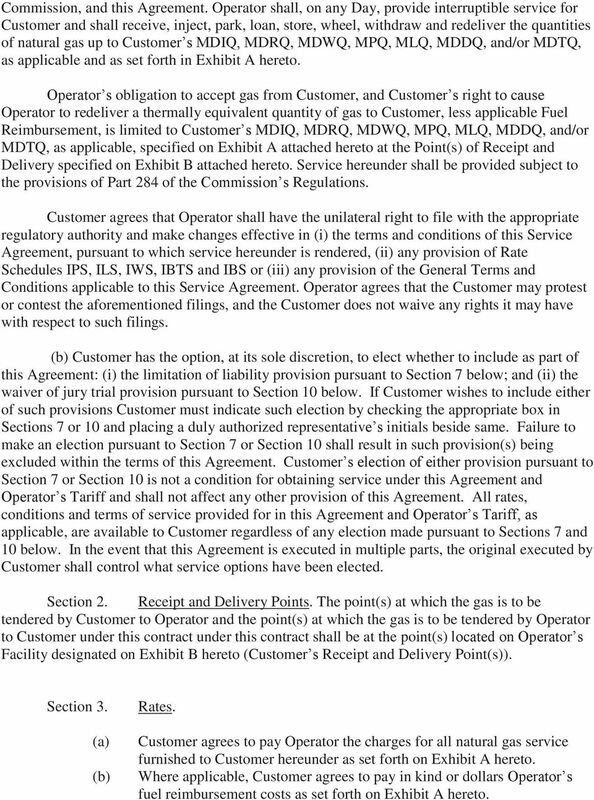 All rates, conditions and terms of service provided for in this Agreement and Operator s Tariff, as applicable, are available to Customer regardless of any election made pursuant to Sections 7 and 10 below. In the event that this Agreement is executed in multiple parts, the original executed by Customer shall control what service options have been elected. Section 2. Receipt and Delivery Points. 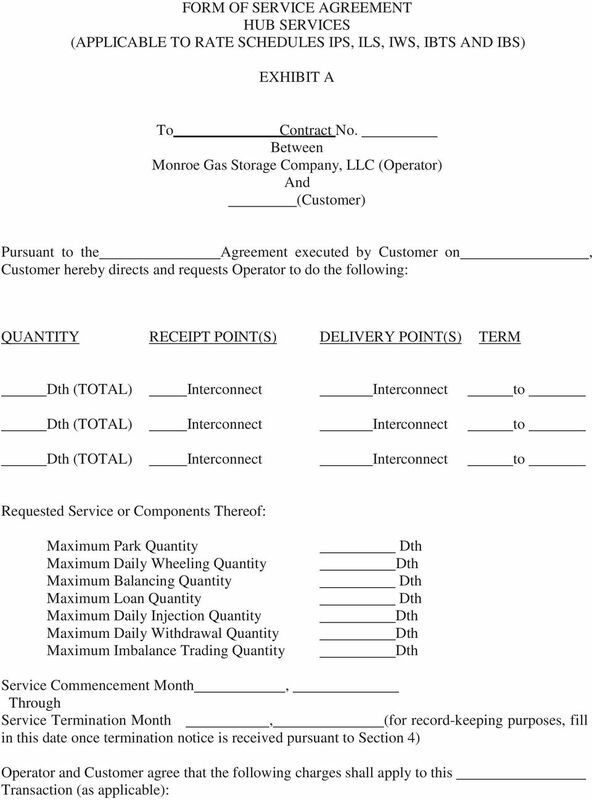 The point(s) at which the gas is to be tendered by Customer to Operator and the point(s) at which the gas is to be tendered by Operator to Customer under this contract under this contract shall be at the point(s) located on Operator s Facility designated on Exhibit B hereto (Customer s Receipt and Delivery Point(s)). Section 3. (a) (b) Rates. 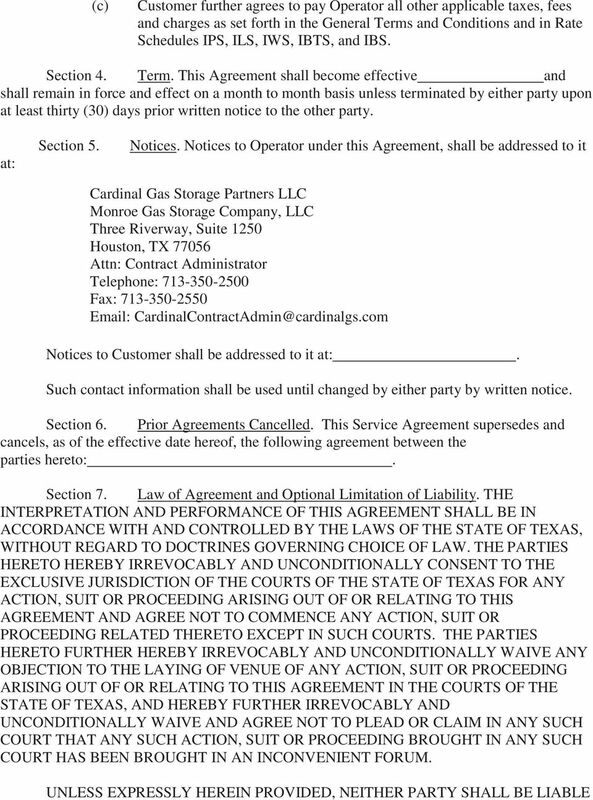 Customer agrees to pay Operator the charges for all natural gas service furnished to Customer hereunder as set forth on Exhibit A hereto. Where applicable, Customer agrees to pay in kind or dollars Operator s fuel reimbursement costs as set forth on Exhibit A hereto. 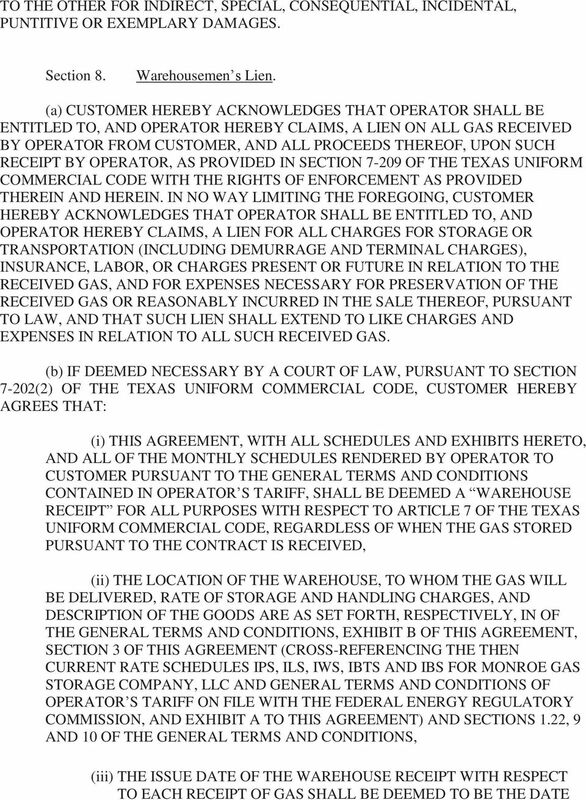 5 SUCH GAS WAS RECEIVED, (iv) THE CONSECUTIVE NUMBER OF THE RECEIPT SHALL BE DEEMED BASED ON THE DATES OF RECEIPT WHEN LISTED IN CHRONOLOGICAL ORDER, BEGINNING WITH THE FIRST RECEIPT OF GAS UNDER THE TERMS OF THE CONTRACT, AND (v) THE SIGNATURE OF OPERATOR ON THE CONTRACT SHALL BE DEEMED TO BE THE SIGNATURE OF THE WAREHOUSEMAN. Section 9. 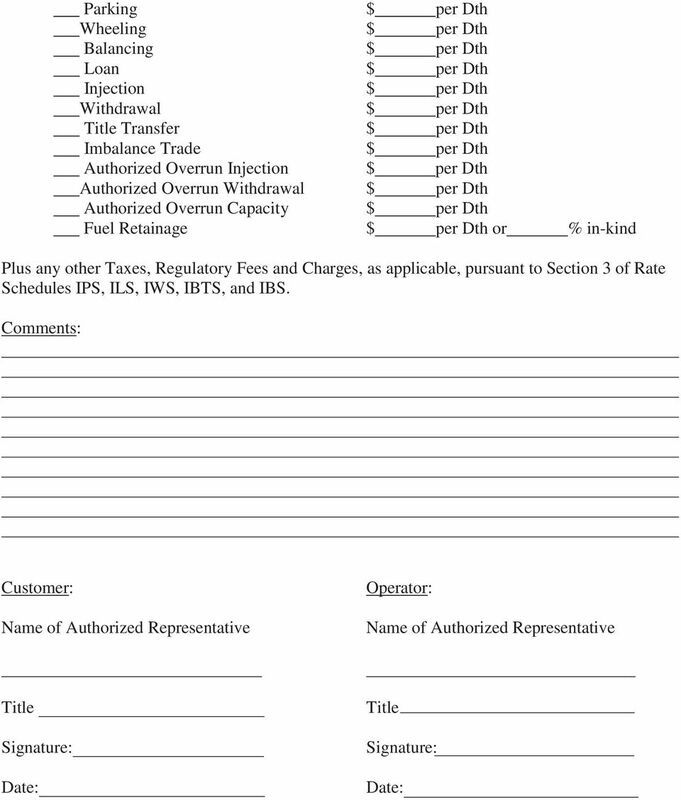 Transfer and Assignment of All Agreements. Any company that succeeds by purchase, merger, or consolidation to the properties, substantially as an entirety, of Operator or of Customer, as the case may be, shall be entitled to the rights and shall be subject to the obligations of its predecessor in title under this Agreement. 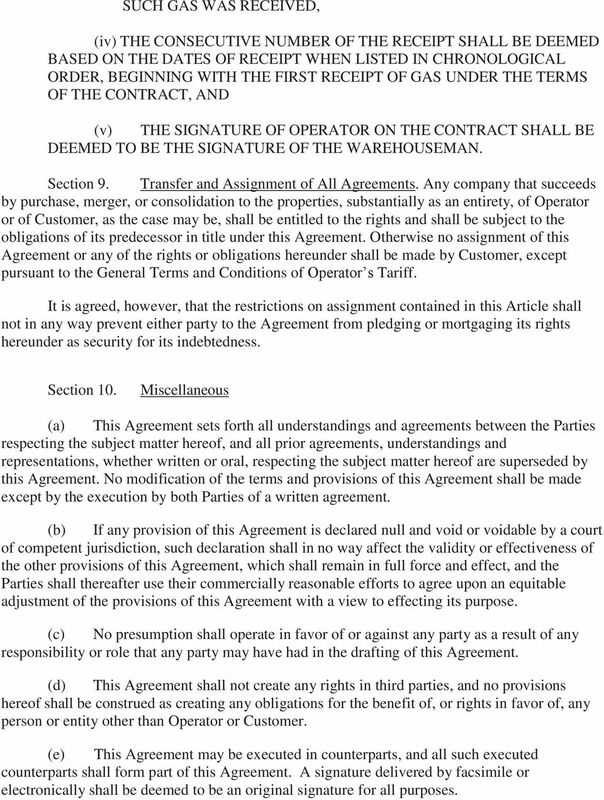 Otherwise no assignment of this Agreement or any of the rights or obligations hereunder shall be made by Customer, except pursuant to the General Terms and Conditions of Operator s Tariff. It is agreed, however, that the restrictions on assignment contained in this Article shall not in any way prevent either party to the Agreement from pledging or mortgaging its rights hereunder as security for its indebtedness. Section 10. Miscellaneous (a) This Agreement sets forth all understandings and agreements between the Parties respecting the subject matter hereof, and all prior agreements, understandings and representations, whether written or oral, respecting the subject matter hereof are superseded by this Agreement. No modification of the terms and provisions of this Agreement shall be made except by the execution by both Parties of a written agreement. (b) If any provision of this Agreement is declared null and void or voidable by a court of competent jurisdiction, such declaration shall in no way affect the validity or effectiveness of the other provisions of this Agreement, which shall remain in full force and effect, and the Parties shall thereafter use their commercially reasonable efforts to agree upon an equitable adjustment of the provisions of this Agreement with a view to effecting its purpose. (c) No presumption shall operate in favor of or against any party as a result of any responsibility or role that any party may have had in the drafting of this Agreement. (d) This Agreement shall not create any rights in third parties, and no provisions hereof shall be construed as creating any obligations for the benefit of, or rights in favor of, any person or entity other than Operator or Customer. (e) This Agreement may be executed in counterparts, and all such executed counterparts shall form part of this Agreement. A signature delivered by facsimile or electronically shall be deemed to be an original signature for all purposes.